Here are some quentions and answers about the adveture you are about to embark upon. How can I apply for a ride? Send us a message HERE if you want to take part in such a program. If you have any plans about the exact time, write to us which day and which part of the day you would like to fly. In the winter please let us know a few days earlier, in the Summer 1 to 2 weeks earlier if possible. (In the Winter, it is possible to balloon all day, but in the Summer ballooning is possible only at sunrise and before sunset due to the atmospheric conditions.) Let us also know how many of you wish to come. You are free to call us, but we would rather you sent us a MESSAGE because we will respond to your e-mail either in writing or over the phone very fast. At that point, we can even tell you whether the day of your planned flight is free and if the weather is expected to be appropriate on that particular day. A balloon ride as a gift? Many people do give give balloon rides as a gift to others, since this is a really unforgettable experience. If you want to purchase it for a gift (for example for a birthday or wedding) you don’t have to worry about making arrangements with the passengers concerning when they have free time for the ride. 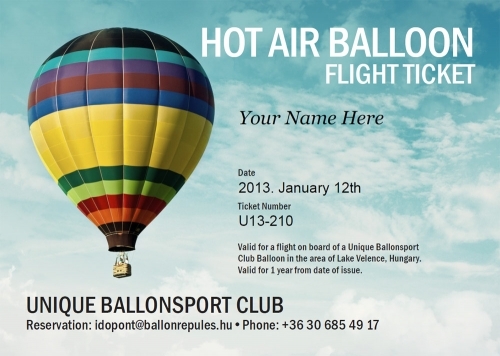 If you give it as a gift, then we provide you with a beautiful, personalized balloon ride ticket, which can be used any time within one year after purchase. The card has our contact data so those receiving the cards can contact us and they can make the arrangements with us. How much does such a ride cost? Where can the ride take place? Can I choose a location far from Budapest? Yes, you can. We can go to the countryside. In this case, we either charge you an extra fee for having to travel further or we will help you find local ballooning companies in that area who can fulfill your request. You can then save this extra fee. How many people can participate in a ride at the same time? The balloons that we own are for four - six, seven people. This means three - five, or six passengers and one pilot per balloon. If there is a bigger group, we will bring more balloons. We have had cases where 28 passengers were flown. What if the weather is rainy or stormy on the chosen day? In spite of the fact that people specializing in balloon rides including us have a special meteorological support service, it can happen that we have to cancel a ride once in a while due to bad weather. (Strong winds and rain make it impossible to do this sport.) Sometimes, we are forced to cancel 2 to 3 days before a ride, and rarely on the day of the ride or the previous day. In this case, we make a new appointment, it goes without saying. So yes, rain or strong winds can ruin our plans but this is normally known days earlier. What kind of preparations are needed? Setting up the balloon is a unique experience and an adventure in itself. Setting the balloon involves unpacking the envelope (the balloon), putting together the wicker basket, then filling the envelope with air and, finally heating that air. It’s done much like in the video below. What is this special ceremony after the ride? What height will we reach? Can you steer this special air vehicle? In other words, where are we going to fly? How can we get back to where we started? There is a car that follows the balloon, the purpose of which is to find it after landing as soon as possible. At that point in time our helpers – as the name suggests – help wrapping the balloon and they take all the parts and the passengers back to the starting point. How to prepare for the ride? There is nothing special that you should do. It is as if you went on an excursion. Take a jacket with you, wear jeans or some kind of trousers. A baseball cap is a good idea. These things come handy because the burners, especially when heating the air in the balloon, can be a bit too hot so these clothes can protect your downy hair from getting singed. :) If you take gloves with you, you can help setting up the balloon… this is an adventure itself. Some food and drink is also a good idea. Maybe wearing boots is better because the grass is dewy in the morning. Shall I take a camera or a video camera? Absolutely! It would be a big mistake not to record the experience in some way and the landscape from a bird’s eye view! Is there a lower or upper age limit for hot-air ballooning? No. Hot-air ballooning is the safest of all air sports. This sport appeared in Hungary in 1986 and it hasn’t claimed any lives in this country. Yes, both in the Summer and in the Winter. Only strong winds and rain or snow make it impossible to fly, but there are often clear, nice days during the winter, too.